Maybe that’s why my father had a hand in writing his own obit; he wanted to tell his own story. I learned this fact only after his July 2016 death. I could have guessed it, though, because the spare, no fanfare obituary was as spare and no fanfare as he. My mother, however, didn’t write hers. I did that solemn duty the morning after her death, brought on by a fall, on April 22. Mom’s obituary is nearly as spare as Dad’s with only two, small flourishes. Mom was a euchre-playing shark and she could sew anything from dishtowels to her pastor-brother’s albs. She wasn’t just a seamstress; she was an artist. But the official obituary of Twila Ruth Guebert, 86, of Red Bud, IL, doesn’t touch on her fuller, more challenging life: her birth into poverty on a Dust Bowl Nebraska farm; the unfathomable hard work she and her family later endured on a worn-out, southern Illinois hill farm just to eat; childhood rheumatic fever; how she was so smart she skipped fourth grade; or why she never told her stern parents about her dreams to be a nurse. Her wedding came only three months after her high school graduation when she married my father, five years her senior. At 19 she was a mother, again at 20, and then again at 21. I was born two months after she turned 23; Perry when she was 25. There was a sixth child eight, merciful years later. How did a 25-year-old with five children under age seven on a 720-acre, 100-cow dairy farm at the end of the road manage it all? Like many farm women of that era I suspect, she often didn’t. Oh, her sewing machine ran past midnight and she beat the sun to the kitchen most mornings, but it wasn’t enough. There was always canning, noon “dinner,” laundry, diapers, in-laws, and countless other mother and wifely duties waiting. That’s where we came in. When my brothers, sister, and I got old enough to climb a ladder to wash windows, hold a hoe to weed, or use a paring knife to peel potatoes, we were put on the assembly line to boost production. It usually ran from 7 a.m. to 7 p.m. every day we weren’t in school or in the dairy barn with Dad and Howard. And it wasn’t just tough; oftentimes it was too tough. We came to dread the work because while it yielded delicious food, a clean house, and a sense of German Lutheran pride, not one of those Ball jars held one laugh and no shiny window or polished floor sparkled with one smile or one joke. 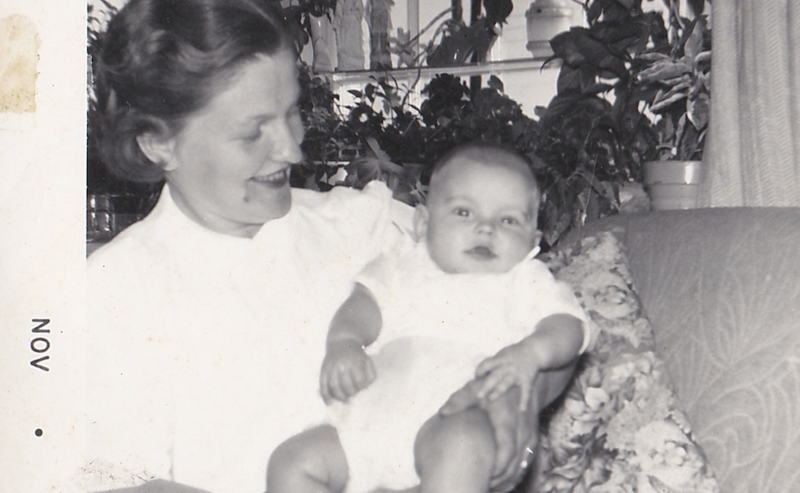 In short, none of it—not our work, output, or success—made my mother happy. I wonder how many farm women of that era experienced similar trials, similar unhappiness, and similar darkness? No one ever talked about it then and few even talk about it now. Why? The silence almost killed her. Despite the many unspoken reasons for my mother’s unhappiness during those backbreaking, kids-everywhere years, the darkness seemed to lessen when grandchildren and financial stability arrived. First came grandsons, then, a gaggle of granddaughters and great-granddaughters. With them she became the mother who, maybe, she always dreamed she would be. Patiently teaching them how to make peach pie and sew doll clothes, encouraging them to raid Dad’s candy jar when he was snoozing by the TV, showing them where gallons of ice cream lay waiting for them to make into chocolate malts. All the while laughing and smiling, something her children never saw or heard. Throughout that welcome change, however, she kept her skeptical, tough eye on life. Her hard beginnings and decades of hard work seemed to have perpetually wrapped her in a hard shell that never allowed her a restful, soulful peace. I humbly pray, Dear Lord, may she finally have that eternal rest. Surely she earned it.